On our last full day in Banff I decided to go exploring instead of skiing. I left our cabin in the morning shortly after my parents headed out to take my brothers skiing at Lake Louise. 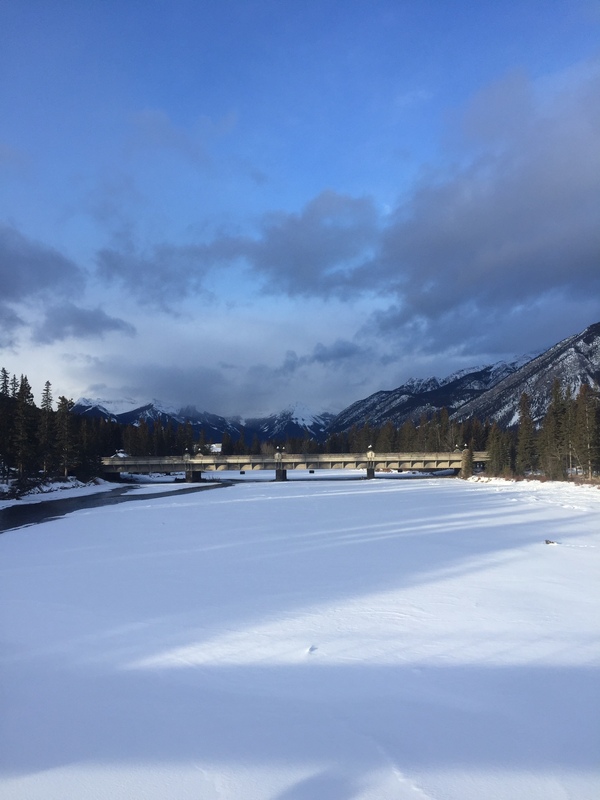 Banff is a touristy, nature- and outdoor-centric town, so there are many trails and natural spots in the town. The public transit system — The Roam Bus — makes getting around very easy, and signs are posted everywhere, so it’s very difficult to get lost in and around Banff. I walked a few blocks from the bus stop to the Bow Falls Trail which borders the Bow River on the south side of Banff. My target birds for the walk — and the trip — were Boreal Chickadees and an American Dipper. There were Mountain Chickadees, Red-breasted Nuthatches, and White-winged Crossbills in the spruce trees. I also saw my lifer Boreal Chickadee in the flock, but all the birds were too hidden in the trees so I didn’t get any photos. 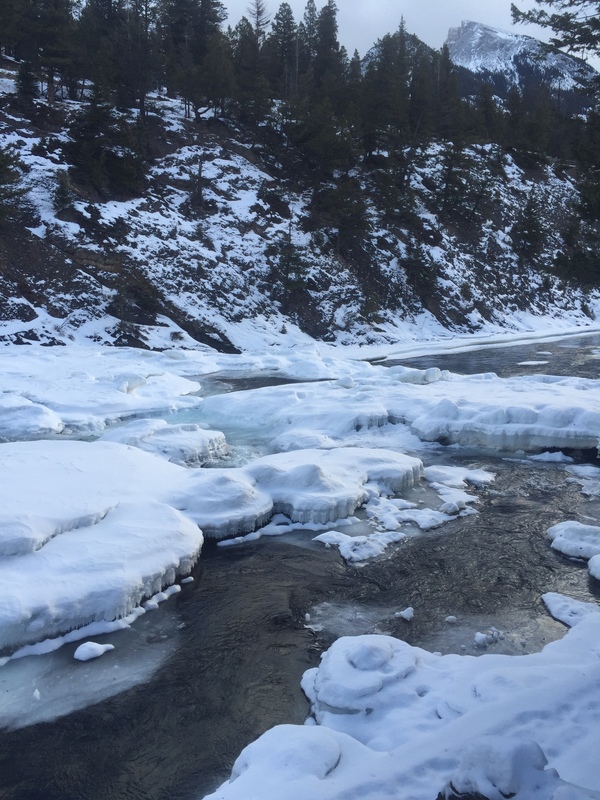 I walked along the river’s edge, but it was absent of Dipper life. Here’s my eBird checklist from my walk. 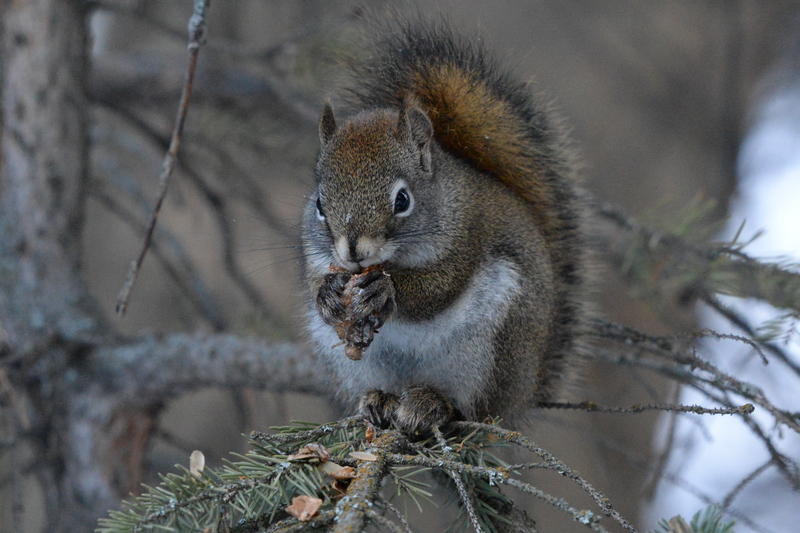 I did get some good shots of the mammals on the trails. 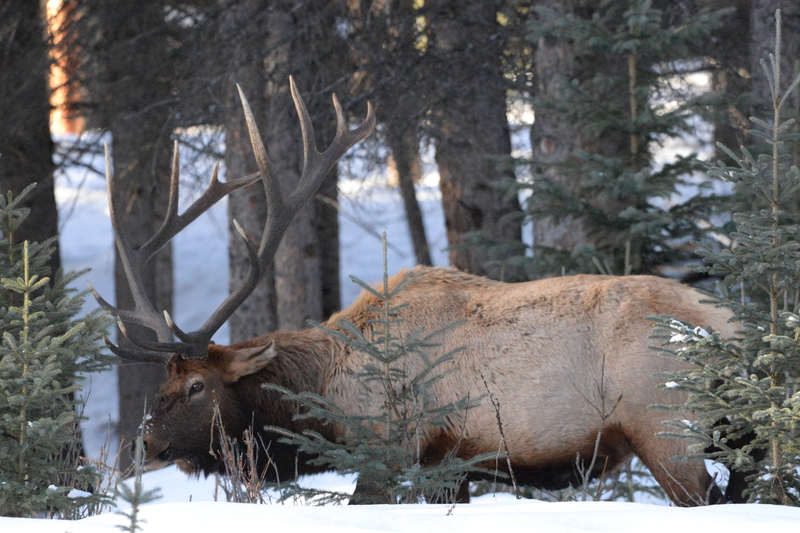 Just off the path was this big bull Elk. 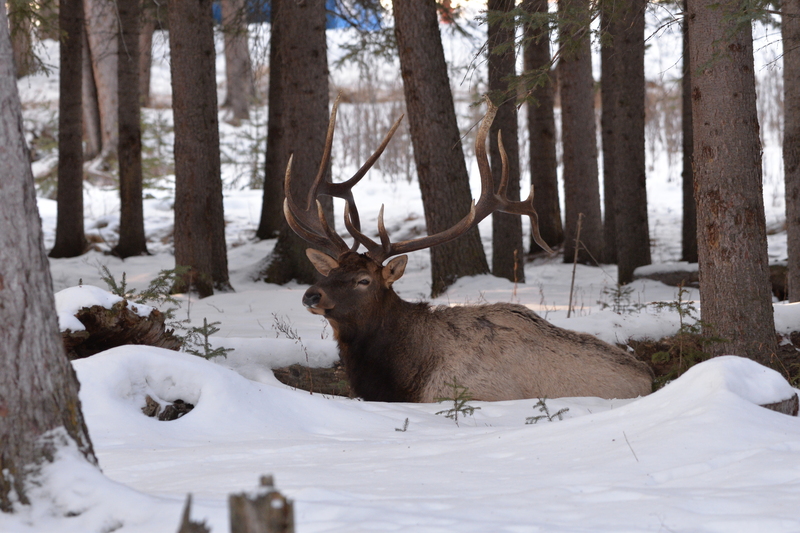 Elk are a very common sight in the town of Banff and throughout the National Park as well. These big ungulates are very habituated to people, but that doesn’t mean people should go near them. They are large wild animals and capable of a lot of damage. 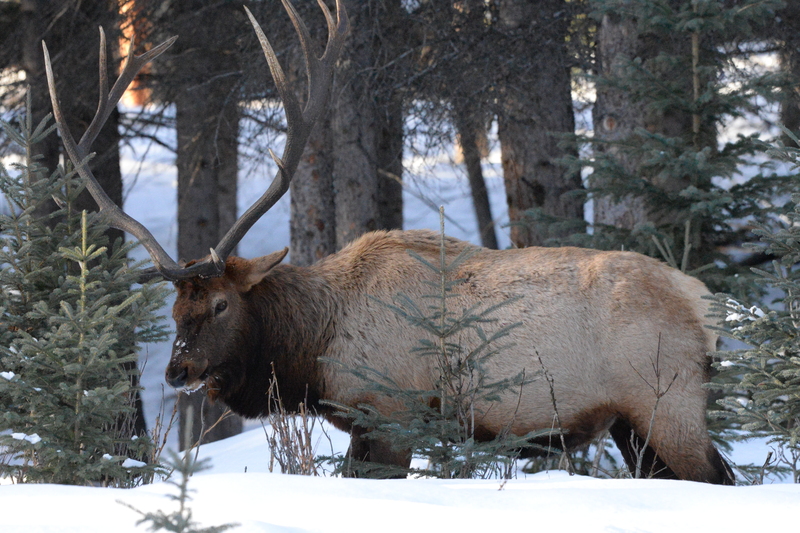 If you find yourself around Elk or any other mammals, please give them space. The only camera other than my iPhone that I used on the Banff trip was my Nikon D610 with the 200-500mm lens. 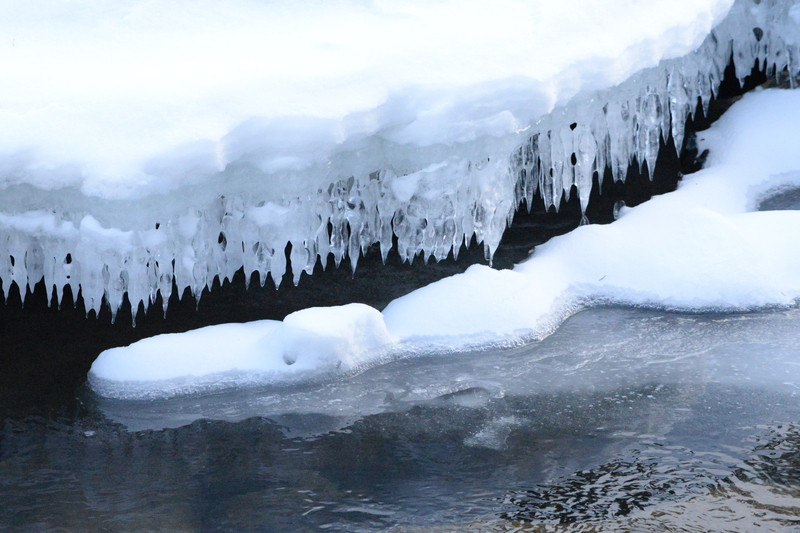 Because of the very cold weather at home and not having extra time, this was the first time I’ve been able to use the camera and lens for any appreciable amount of time, and I really enjoyed using both. 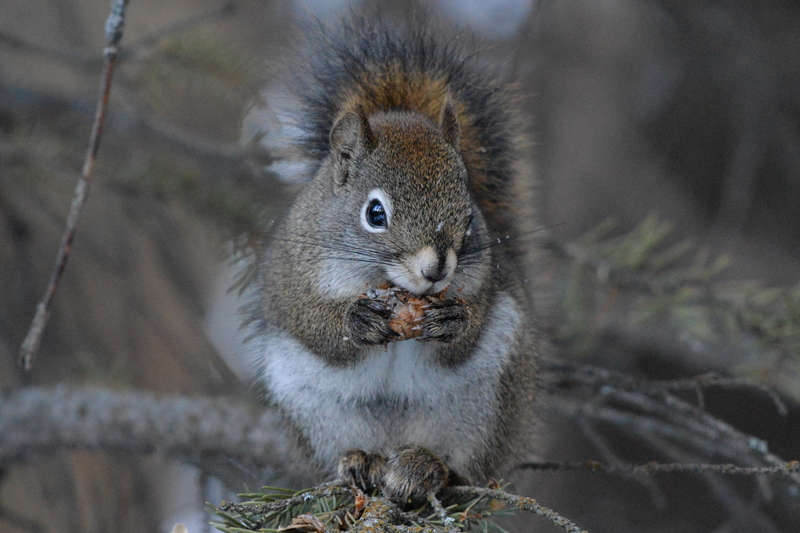 The lens isn’t appropriate for landscape use because of its close focus, but it’s perfect for close-ups of animals. Please stay tuned for the afternoon part of my last day in Banff! 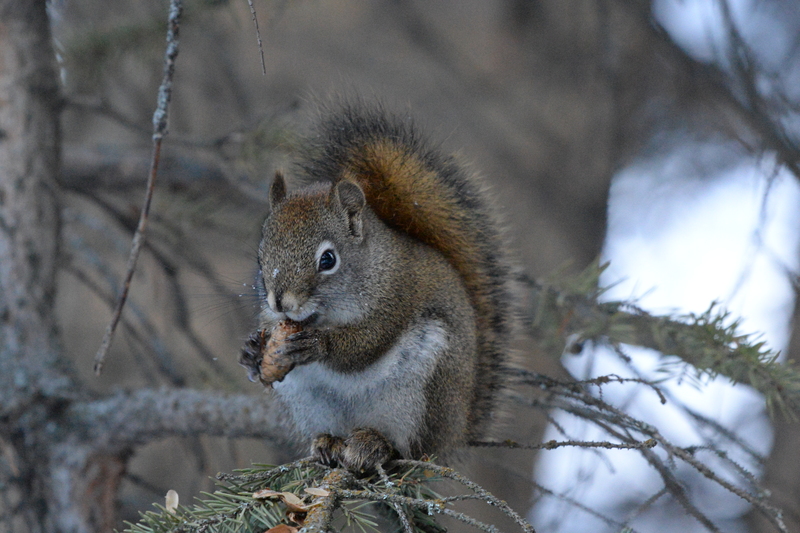 This entry was posted in Alberta Animals, Alberta Birds, Birding, General Birding, Nature, Wildlife, Winter, Year List and tagged Alberta Birding, Banff, Elk, Mammals, National Park, Nature Photography, Red Squirrel, Rocky Mountains, Winter. Bookmark the permalink. Enjoyed this post and images, especially your comment about “being scolded”— made me smile. The squirrels think they own the woods. Lol! Great photos. I remember seeing many Elk grazing on the lawn outside the visitors’ centre in Yellowstone. Thank you. I think Banff is the Yellowstone of Canada. 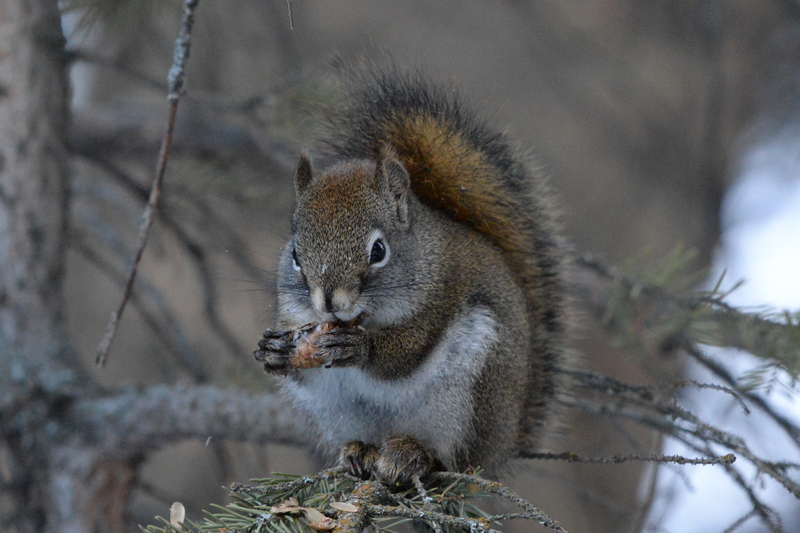 Those Red Squirrels! They’re a constant hindrance to birding by ear, and mostly seem to keep yelling at you until you’ve moved away to a safe distance. More correctly, I suspect, they’re informing every living creature in hearing distance of your presence, upon which multiple other squirrels and assorted birds will join in as backing singers. Yesterday I was trying to listen for the bark-peeling of a Three-toed Woodpecker, but I could hear nothing over the half-dozen or so Red Squirrels and even more Magpies in full warning voice! 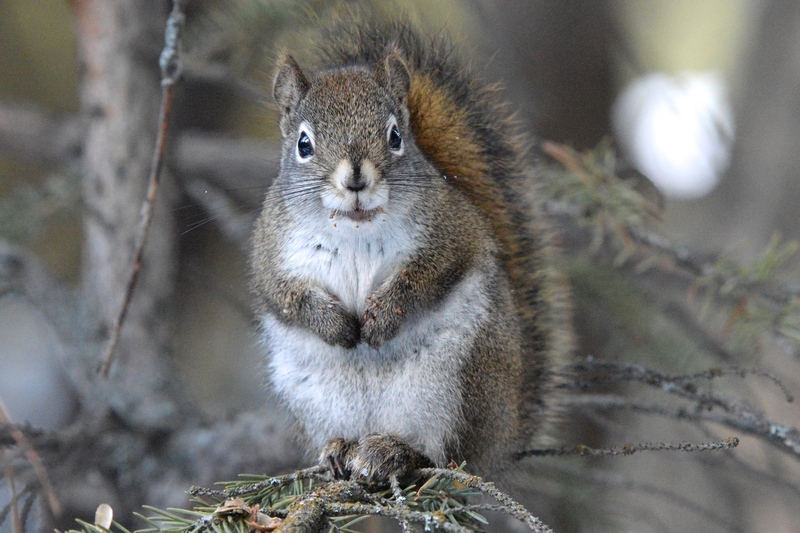 I always imagine the squirrels feeling rather smug when I yield and move away. Anthropomorphic I know, but it amuses me to think so. I think someone needs to come up with a squirrel mute remote for those days they just don’t stop chattering. 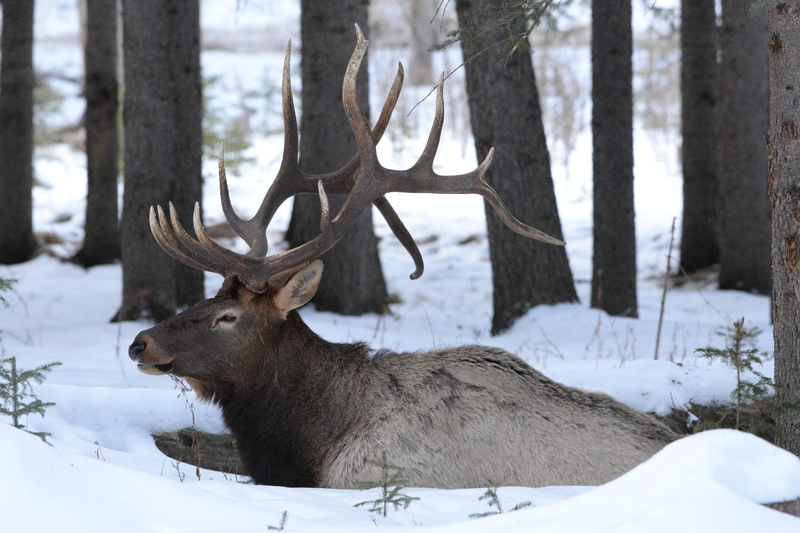 You really got so fabulous shots; the images of the big bull elk were really stunning. He was a beautiful specimen and incredibly cooperative. I didn’t think I’d get so lucky with them. Banff is now one of my favourite places.